Isn't it a pretty color ? I wish it had maintained more of the brilliant purple color of the yams after they had been cooked. The inspiration for this dish came from a small package of dehydrated purple yam powder I purchased at an Asian grocery store in Chicago. I was curious what to use it for, but the back of the package said it was for dessert. Sounded good to me ! I rehydrated the powder, then added some tamarind paste I had also purchased at the same market. I decided to add ginger to round out the flavor, and it is a really unique combination, reminiscent of pumpkin pie. I wasn't completely happy with the somewhat grainy texture, which I would assume is related to using a powder for the yams rather than real purple yams. so that would be the next step. 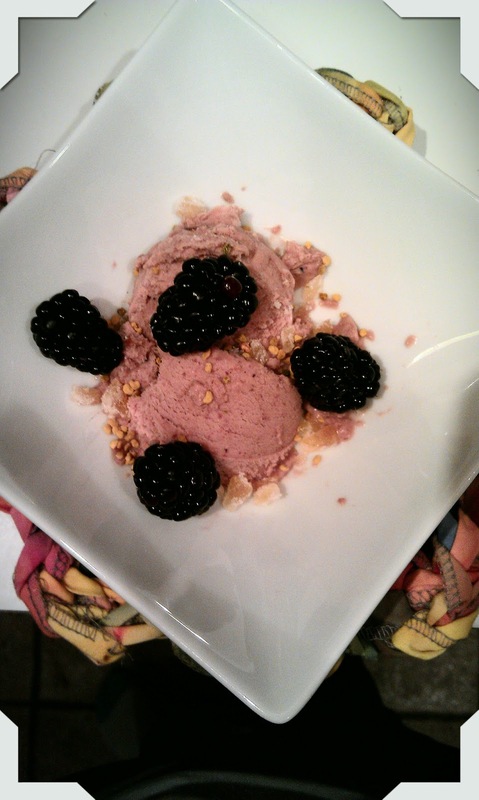 I topped the ice cream with fresh blackberries, chopped crystallized ginger and some bee pollen, it was one of the best desserts I have ever made. In a small saucepan, combine yam powder and water. Simmer slowly for approximately 20 minutes until mixture is thickened and water is completely combined with powder. Stir in tamarind paste and let come to room temperature. In a large bowl, combine yam mixture, ginger, sugar, vanilla, cinnamon, cream and half and half. Process with immersion blender or hand mixer until thoroughly combined. Strain through a sieve, and place in ice cream maker. Process according to manufacturers directions. Freeze for 1-2 hours before serving. Garnish with blackberries, crystallized ginger and bee pollen, as desired.